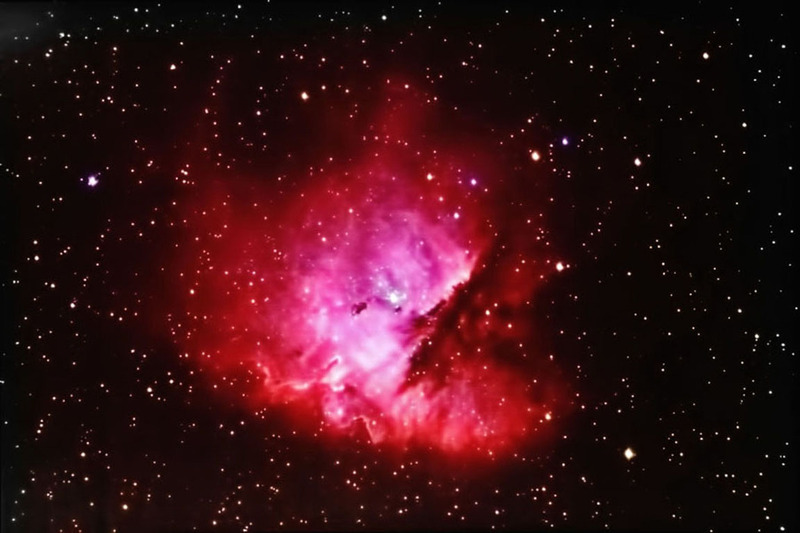 NGC 281 is an open star cluster associated with a relatively large emmision nebula (Sh2-184). This is another fine example of a star-forming region that glows in the red hue associated with exctited hydrogen atoms. The small, darker areas blocking the emmitted light are known as Bok globules. This is also known as the Pac-Man nebula because, with the tilt of the head and a squint, it resembles the video game character. Processing: Images were aligned and combined using ImagesPlus. The color and Ha images were aligned in RegiStar. The final image was then adjusted (Curves, Levels) in Photoshop CS. Finally, Topas DeNoise was used to reduce noise. Location: My backyard observatory in SE Minnesota; taken over four separate nights. It was near 0 F during the Ha exposures.